It’s Time to Duel around the world! Konami and the Yu-Gi-Oh! TCG will be celebrating the 200th Yu-Gi-Oh! 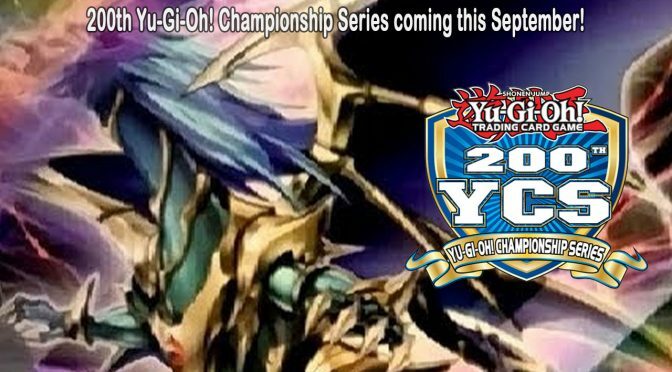 Championship Series (YCS) simultaneously in The Netherlands, Mexico, and the United States on September 22nd & 23rd. In Europe, Duelists will head to The Netherlands, as the city of Utrecht will kick off the festivities. 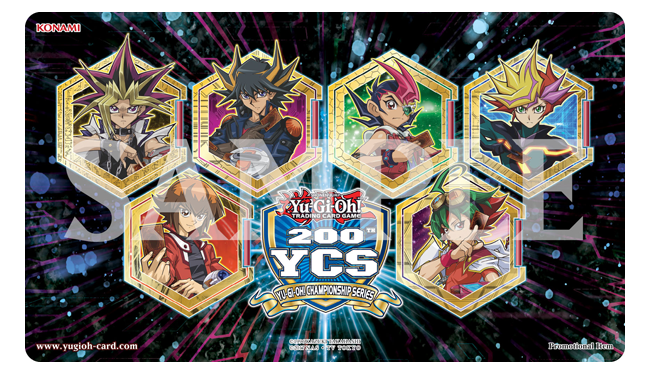 A few hours later, Duelists from the Americas will compete in Columbus, Ohio (United States) and Mexico City (Mexico) as their respective 200th YCS tournaments kick off. Konami will have special prizes and activities on offer at all 3 locations, and today we are revealing the first of those, the Game Mats! A number unique Game Mats will be exclusively available at these tournaments, read on to find out how you can take some home! First up is the 200th Yu-Gi-Oh! Championship Series Participation Game Mat. 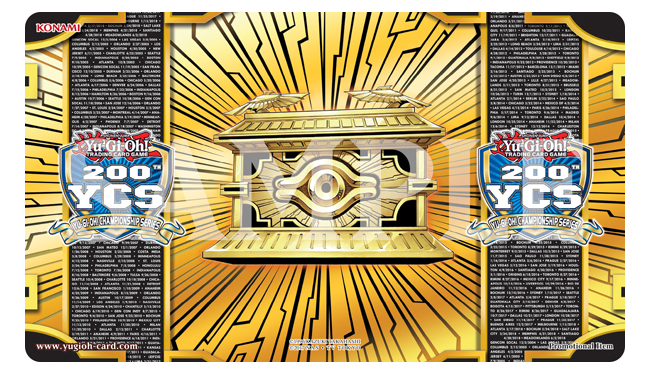 This will be available to every Duelist who registers for the main event at each location (while supplies last). 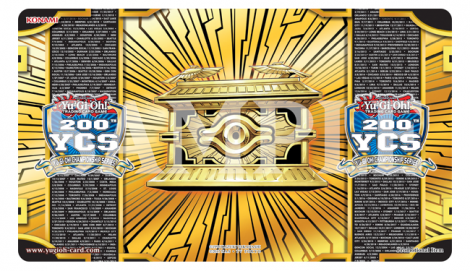 Gold Sarcophagus takes centre stage, surrounded by the history of the Yu-Gi-Oh! Championship Series, marking every date and city we have visited so far. Here’s the 200th Yu-Gi-Oh! Championship Series Win-A-Mat! You can win one of these by competing in special Win-A-Mat tournaments at each location. 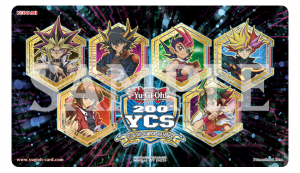 As with every YCS there are many Public Events to take part in throughout the weekend, and these Win-A-Mats are sure to be popular. 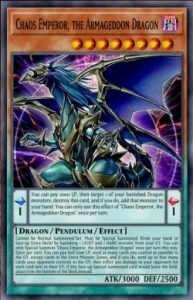 Chaos Emperor, the Dragon of Armageddon, new 2018 Yu-Gi-Oh! Championship Series Prize Card! Say hello to Chaos Emperor, the Dragon of Armageddon, your new Yu-Gi-Oh! Championship Series Prize Card! Chaos Emperor Dragon – Envoy of the End was a widely-feared adversary who marked its appearance to the field with complete destruction. From the moment this monster hit the field the fates of Duels were sealed. Such power has been Forbidden for an eternity but now this Dragon is back in a terrifying new form. 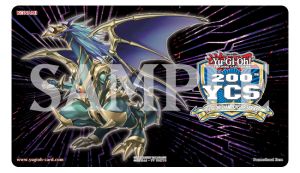 Chaos Emperor, the Dragon of Armageddon will be the Prize Card at Yu-Gi-Oh! Championship Series events for the upcoming year, awarded to top 3 Duelists of the main event(s) and the winner of each Public Events playoff. To celebrate its debut however, the top eight Duelists at each 200th Yu-Gi-Oh! Championship Series event will win a copy of Chaos Emperor, the Dragon of Armageddon! The Ultra Rare version is exclusively awarded to 1st Place at each YCS, with all other winners receiving the Super Rare version. Previous PostWorld Championship 2018 Celebration Event!Next PostCybernetic Horizon: Upgrading Cyber Dragons!